"Coming from Ripley it did me good to break out of a small town and meet new people from different backgrounds. It took me out of my comfort zone." At the age of just 22 former Derby College students Emma Jarrett is celebrating her first year as co-director of a logistics business. 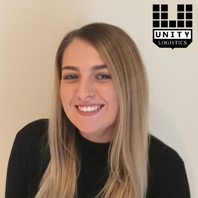 Emma, who took A levels at Joseph Wright, now runs multi-modal freight forwarding company Unity Logistics Limited in Rotherham with her business partner Simon Arnold. The young entrepreneur gained the industry experience she needed while working for a Sheffield-based logistics company – but is convinced she would not have had the confidence to pursue her career goals without Derby College. Emma had spent a year studying A levels at school but sixth form just wasn’t working out for her. So, impressed by the college’s facilities and inspired by its good reputation, she switched to Joseph Wright. As well as providing her with valuable A levels in Business, English Language/Literature and Psychology, Emma says the college spurred her on and gave her the courage she needed when looking for a job. After college she couldn’t find regular nine to five office work so she contacted a local employer to ask if they would take her on voluntarily in exchange for business administration experience. While becoming involved with exports at a basic level, Emma gained an insight into the industry and was intrigued to know more. This work experience led directly to employment with a Sheffield-based freight forwarder. Emma was placed on the company’s graduate programme so she could gain a comprehensive knowledge of its operations, including providing freight quotations, making bookings and arranging transportation with haulers, agents, principals and carriers.